Topping the list as one of, if not the best of all the planned communities in Orange County, the beautiful picture-perfect Talega sits atop the hills in San Clemente, bordering a Nature Reserve and its compromised of newer homes and condos, having options for those wanting ocean view homes, gated communities, senior communities, or just family friendly features, like many cul-de-sac locations, walking distance to parks and pools or school, and many trails to mention a few. The neighborhood was finally completed in 2016 with the last neighborhood built ( beautiful open floor plan luxury homes at Alta), but there's always Talega homes for sale (resales) and are known for being a favorite for active families: the neighborhoods layout make it easy for bike riding, exploring Talega's 19 miles of trails, climbing the 760-foot Nob Hill, using the great sports center called Talega Swim and Athletic Club, using the several pools and parks and the Talega Community Association lists many fun activities for its residents throughout the year, all of this combined with the great location with easy access to the Vista Hermosa Sports Park, the newly opened La Pata road and of course, the beaches nearby. Many homes have ocean, hills or golf course views, and in the center of the area, there's the 'Talega Village Center' with restaurants, shopping and Ralph's Fresh Fare. The area has four of the nicest parks in all San Clemente with picnic areas, baseball and soccer fields and top of line playgrounds, and many other tot parks. 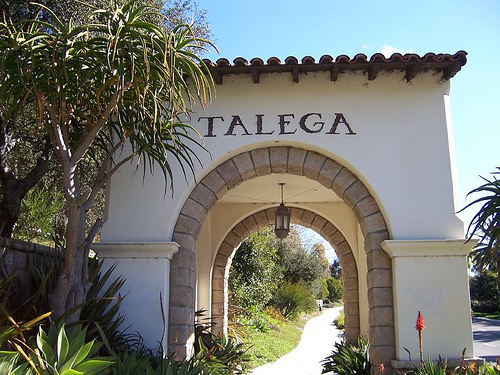 Talega homes are served by the Capistrano Unified District : Vista Del Mar Elementary School and Vista del Mar Middle School, both award winning schools ( Gold Ribbon and Honor Roll) and to top the list, Talega has the Talega public golf course, with it's clubhouse. View all Talega MLS listings below. For more information about any of the Talega homes listed for sale below, please contact us or call us at (949) 888-6788. Read more about what the Talega real estate has to offer. The Talega real estate and its architecture is predominately Spanish, Spanish - Tuscan or Mediterranean, and the options are very diverse, from condos and townhouses to large estates. There are five condo complexes in Talega and over thirty five separate neighborhoods, the condos ranging in price from the high $300,000 to about $600,000, and the homes from the high $600,000's to the high $2M. The condos are known for having the look of townhouses and having a private pool and spa area, some even have 2 sets of them. The Talega tract homes range anywhere from 1800 sq ft in size, to over 5500 and some are semi custom or in gated communities. All the homes get access to the Swim and Athletic Club, two other neighborhood pools, four main parks and many other tot parks and green areas the area offers. The condos in Talega also have their own private pool and spa areas and access to all the other Talega amenities. The Real Estate market of Talega offers many homes featuring private pools and spas and meticulously detailed custom backyards with fireplaces and outdoor kitchens. The homes were built by top builders and designers, and have the latest designer upgrades. 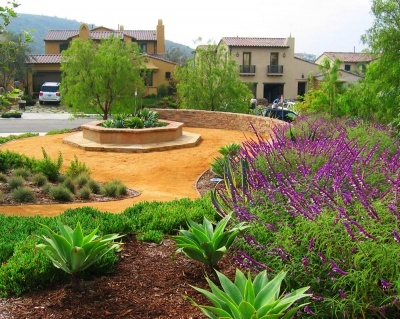 What people really love about Talega is the sense of living in a suburban neighborhood, with the perfect mediterranean weather, with the access to nature, trails and modern day facilities, but to be less than 3 miles away from the beautiful beaches of San Clemente and South Orange County. When buying a home in Talega, keep in mind that the buyer will be responsible for a 0.25% of the purchase price as a 'lifestyle fee', and like in newer communities in Orange County, Talega has mello-roos assessments on top of the property tax. 1. The Talega South-East homes: these are the homes located in neighborhoods that are fed of La Pedriza or Avenida Pico, that were the first homes built in Talega, around 2000- 2003. These homes are 'older' to Talega standards, and have a great advantage: because mello-roos bonds are set at the original sales price, the mello-roos bonds in these homes are going to be considerably less than in other areas of Talega, making the property taxes more affordable. There's condos like the Trinidad development, smaller homes like Solana, Seaside and Farralon Ridge, medium sized homes, but also great estates like the ones found in the Vizcaya neighborhood or Pacifica and Montellano. The beautiful Cristianitos Park is located here too, as well as access to trails and Talega's Nob Hill, the Talega Swim and Athletic Club, and the only senior and gated community in Talega : The Gallery. One disadvantage: the booms from the nearby trainings in Camp Pendleton that can be heard in all San Clemente, can be specially loud within the nieghborhoods close to the 'end' of Avenida Pico. 2. The Talega Central homes: these are the homes in the neighborhoods that are fed off Avenida Talega. All the homes ( with the exception of the neighborhoods located by the Vista del Mar School: San Rafael, Portofino and Terra Linda) were built after 2005. Top of the line and the latest architectural designs were incorporated into these homes. Most of the few gated communities are located here, and many homes have views of the hills, nature, ocean and golf course. Easy access to trails, a gorgeous park known as Tierra Grande Park or to the residents as the 'Barn Park' and its pool is located here, together with other tot parks and green areas. The downside: higher mello-roos bonds. 3. The Talega West side homes: these are the condos and townhouses, built around 2004-2005 and located west of Avenida Vista Hermosa, in the 'Talega Village'. The Village is a shopping center that features a Ralph's Fresh Fare, with organic products, a 'Peets Coffee' shop, several boutiques and restaurants. The entrance to the Talega Golf Course Club is located here as well. The neighborhoods here are an excellent choice for those looking for smaller homes as condos, with lower maintenance, private pools, spas and bbq areas, and the easy walking distance to the many amenities. And for those with kids, these neighborhoods are within walking distance to the Vista del Mar Elementary and Middle School. 4. The Talega North-East side homes: these are the homes located on the northen side of the neighborhood, off Avenida Saluda and Avenida Vista Hermosa. The area has all kind of homes, from condos in the Verano development, to smaller homes like Amalfi and Escala, to the larger homes like Sansol and Mirador. Homes here were built around 2004-2005 during the housing boom. These homes have easy access to the Liberty Park and its pool, to the trails behind them, access back to the 5 freeway via Avenida La Pata, and close proximity to Target and the Vista Hermosa Sports Park and its many amenities. Looking for an specific type of Talega Home? We are experienced Talega Real Estate licensed Realtors ®, who live in the area and can help you with your Talega and any of its homes transaction.